If there's one thing that happens around babies, it's mess. Food stains, spit ups, poop, it's all going on. And it's all hard to get out, especially considering that pretty much all baby clothes are either white, or light colors. You need the best baby laundry detergent. You've also got to factor in that when a child is first born, their skin is so much more sensitive than yours or mine. This makes using a normal laundry detergent pretty much impossible, because your little one will end up with rashes, eczema, or even worse. That's why you need a specific baby detergent, which is specially formulated to be soft and safe to use on sensitive skin. There's a lot to choose from, though, which is probably why you're here. Read on to find out what you need to look for, and why it matters. Does It Have a Scent, and What Does It Smell Like? 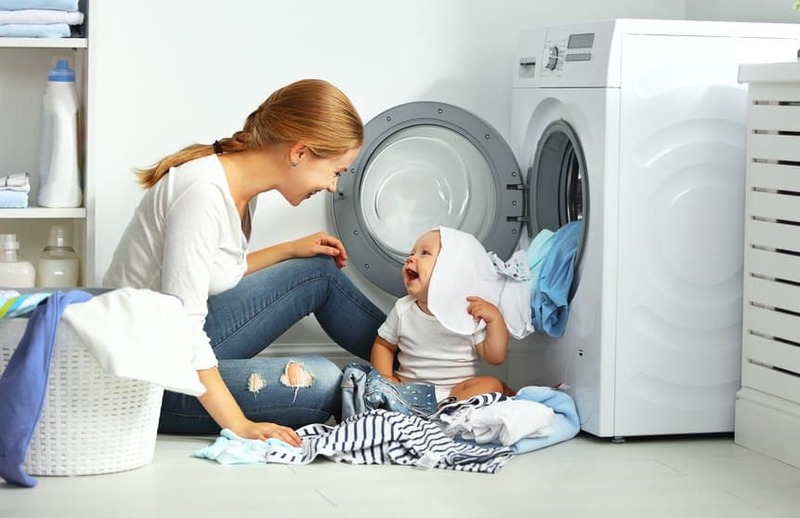 When you're looking for baby laundry detergents, it's important to get something that is either odorless, or doesn't have a scent that's too strong. Little noses are sensitive, and stronger smells can cause problems, especially when they're on clothing that you're wearing all day. Most baby detergents won't have strong scents for especially this reason, so it's not something you'll have to worry about too much, but it's something you still have to consider. Is It Hypoallergenic, and Safe for Skin? When you're first born, your skin is incredibly sensitive, and really vulnerable to things that cause irritation. Most normal laundry detergents are packed with chemicals that can cause these problems, which is why it's unsafe to use them on baby clothes. Baby laundry detergents, on the other hand, are almost always hypoallergenic and free of any of these harsh chemicals, so they aren't going to cause as many issues. Because their immune systems aren't as developed either, sometimes even this isn't enough and your babies will still have a reaction to some detergents. If this happens, it's best to try another, because sometimes the different formula will have a different effect. Whilst this might not matter as much to you, more natural formula are less likely to cause allergic reactions. Especially if your baby has sensitive skin, and wouldn't react well to clothes cleaned with artificial chemicals sitting against their skin all day and night. Plus obviously natural ingredients contribute to saving the environment. This is what you're buying it for, after all. You need it to be safe for baby, great for sensitive skin, smelling great, but none of this matters if it doesn't clean stains out of your babies clothing. Whilst baby detergents aren't quite so strong as normal laundry detergent, that's obviously because they're not packed with the same scouring chemicals that clean normal clothing. Whilst all of our detergents are good at cleaning (obviously, otherwise we wouldn't be recommending them) some are going to be better than others at cleaning particularly difficult stains, like dark food stains and poop. So if you're looking at for detergents for cloth diapers, keep a close eye on this. Money isn't everything, and you'd spend everything you had to make sure your children were safe and healthy, but if you can get a laundry detergent that cleans great, is safe for your baby, and doesn't cost the earth, you'd take it, right? It's easiest to measure how much you get on a per load basis. Whilst the amount you use changes depending on how much you've got to wash, it all averages out. The best thing to do is work out roughly how often you seem to be cleaning, so you can work out how long one bottle will last you. Then you can work from there. Plant based, hypoallergenic and dye free, Purex is one of the single greatest laundry detergents we've found, and our top recommended detergent for newborns. On top of being natural, it's dermatologically tested, too, so if your baby is particularly sensitive or has any allergies, this is also a great choice. It is scented, but the scent is light and easy on the nose. It's supposed to smell like baby. I have to say it doesn't, but I really love it anyway. It's delicate and floral, and so nice I didn't even mind throwing in some of my own clothes with it. Despite how light it is, it's also great at cleaning. You're recommended to only use 28ml per wash, and get around 50 washes from one (inexpensive) bottle, but throwing a little more in for especially soiled clothes works wonders. Overall, this really can't be beat. It does everything you need it to do. It cleans well, it's safe and comfy for baby, and it smells gorgeous. I'd recommend any mom wondering what detergent to buy, to try this one first. When you ask anyone what laundry detergent is good for babies, Dreft is the one that comes to mind. They're recommended by damn near everyone. But why? Well, Dreft make baby laundry detergent aimed specifically at babies, and have over 80 years experience doing it, so it's safe to say they know their market. There's two stages available, stage 1, which is aimed at newborns, and stage 2, for when your baby gets a little older and on the move. It's completely skin safe, hypoallergenic, and cleans amazingly well, especially on tough stains. I'd actually call it pretty much the top laundry detergent for this, especially as a laundry detergent for cloth diapers. When you're using Dreft, there really is nothing to complain about, unless you wanted an unscented detergent, because Dreft does have its own scent. It's quite strong, but I love it all the same. If you want an all natural, skin safe baby laundry detergent for even the most sensitive skin, then Babyganics might be what you're looking for. It's made entirely from naturally sourced ingredients, and the vast majority are plant based. Unscented, it cleans amazingly well, and lasts forever, considering it's a triple concentrated formula. Bear in mind though that this means you hardly have to use any of it at a time, so be careful when you first get it, 'cause you might end up wasting some. The packaging could use some work, because it can leak at times, but then what would you expect from a relatively new company? I've also heard that if you leave your clothes to dry right out, after a few days there can be a little bit of a smell to them, but you should probably be washing them again by then. Overall, whilst it's not in our top two, it's still a great choice, and if you want a more natural choice, this might be the one. Strong, powerful, effective. All baby is all of these, as well as being soft and gentle on baby's skin. It's not a name we've heard of, but I have to say, I was surprised. This holds up to the big names really well, and it's actually really impressive how well it cleans. Even the toughest stains came out perfectly, and that includes soiled cloth diapers. It's completely safe for baby, considering it's free of all of the usual suspects and designed to be gentle, which is great, and it smells amazing. You also get a lot for your money, which is good. If you do two or three washes a week, expect this to last a good few months. The only real problem I could think of was that the smell might be overpowering for sensitive little noses, so bear that in mind. It's not so bad, and you could always give things a quick rinse if you have to. It's just something to think about. Super concentrated, a great cleaner and supremely safe on sensitive skin, Mama Bear stands out for the fact that it's certified by the USDA, so you know that it's safe to use. It's a powerful cleaner, bringing out the whitest whites every time, and only using half as much detergent, which also makes this one of the top detergents if you're looking for value for money, too. If you're looking for something healthy, both for baby and the environment, this is the perfect choice. It's not tested on animals, for one, it's free of pretty much everything you'd expect, and more, and it's over 95% biological compounds. It's no wonder that this got its certification. Finally, it smells really good. It's strong, especially if you use a lot of it for larger loads, but it's not something I ever see myself having a problem with. If you want a natural, certified safe choice, go with Mama Bear. Did you use any of these best baby laundry detergent options when you were looking after your babies? Any recommendations of your own?